Bienvenido! Welcome to Santiago, the capital of Chile. Located in a magnificent setting nestled at the base of the Andes Mountains, this is a great city to start your South American journey. You will be met and transferred to your hotel. This evening, meet your Tour Director for a tour briefing. Fly to Buenos Aires, Argentina, a country rich in history and culture. Buenos Aires is a sophisticated city with a strong European in?uence. It once enjoyed wealth and opulence which is still evident in the elaborate architecture. Get acquainted with this beautiful city known as the “Paris of the Americas”. Visit the central square, Plaza de Mayo surrounded by the Casa Rosada and the Cabildo. We then travel through the charming streets of San Telmo, the home of Tango and down the colourful roads of La Boca. You’re Invited: This evening, we soak up the sultry moves of a tango show accompanied by a sumptuous dinner and famous Argentinian wine. This morning, transfer to the airport for your flight to Brazil and Rio de Janeiro. Rio is a city full of life, colour and vibrancy. Our hotel is ideally located in the middle of the famous Copacabana Beach, so is a great base for exploration. Today, we tour the marvellous sights of Rio de Janeiro. Ride the cogwheel railway up Corcovado Mountain and see the iconic ‘Christ the Redeemer’ statue. Take the cable car to the top of Sugarloaf Mountain for amazing views of the city and coastal landscape. You’re Invited: Have some fun and get to know how the locals party with a visit to the Sambadrome, the site of the famous Rio Carnival#. This evening, feast like a local and get a real taste of Brazil with a typical churrascaria. Transfer to the airport for your flight to the World Heritage listed Iguazú Falls. Set in a tropical jungle, an enormous river spills over towering cliffs to create a thunderous roar. Tour the majestic Brazilian falls. Make your way through the rainforest and along walkways up close to the base of the falls for outstanding views. Tour the Argentinian side of the falls. In contrast to the Brazil side, the Argentinian side follows a number of walkways over the top of the falls for incredible up close views. Board the ecological train and ride to the ‘Devil’s Throat’ viewpoint. Feel the spray and gaze in awe at one of the most spectacular views that Iguazú has to offer. Bid farewell to the natural wonder of Iguazú and transfer to the airport for your flight to Lima, the capital of Peru. This bustling city, known as the “City of the Kings”, is rich in history and culture. A late arrival has us staying at the comfortable airport hotel. Transfer to the airport for your flight to Cuzco, the ancient capital of the Inca Empire set high in the Andes Mountains. As you transfer to the breathtaking Sacred Valley, stop off at Awana Kancha llama farm and textile centre. Gain an insight into the Andean camelids; llama, alpaca, vicuña and guanaco as well as viewing traditional Andean weaving techniques. This afternoon, we head into the colourful town of Pisac with its traditional markets. Enjoy a walking tour of the town of Ollantaytambo, the oldest continuously occupied settlement in the Americas. Your tour includes a visit to a traditional home to see how the locals live, then see the incredible Incan fortress that overlooks the town. You’re Invited: We will then visit a local community which will give you the chance to meet the students and teachers at the local school and learn about their lifestyle. Transfer to the train station and board the Vistadome train for the journey to Machu Picchu. Mystery still surrounds these well preserved ruins perched in between sheer cliffs and your visit will allow you to understand why they are one of the Seven Wonders of the World. Your expert local guide will share stories and knowledge to reveal some of the mysteries of this “Lost City of the Incas”. Spend the morning exploring the quaint town of Aguas Calientes or return for a final visit to Machu Picchu (own expense) before reboarding the Vistadome train back to Ollantaytambo. Return to Cuzco through the beautiful Sacred Valley and across the patchwork fields of the Chinchero plateau. Be guided on a walking tour of the charming city of Cuzco, a World Heritage listed site that was a former capital of the Incas. Visit the Inca temple of Coricancha, head through cobblestone streets and past ancient Inca buildings to Cuzco’s fascinating central market. Explore Inca ruins on the outskirts of the city including the fortress of Sacsayhuaman, and finish with a visit to the beautiful main plaza and its surrounding cathedrals. Today is free to wander the cobbled streets of Cuzco and learn more about the traditions of the Inca, or join us for a tour that will discover more of Cuzco and the surrounds. Tonight, dine at a local restaurant that specialises in nouveau Andean cuisine. Fly from Lima to Quito, the capital of Ecuador that sits right on the equator. You will be met and transferred to your boutique hotel. Fly to the Galápagos Islands and transfer to your ship, the Galápagos Legend. This afternoon, sail to Santa Cruz Island and visit the highlands which is renowned for viewing the Galápagos giant tortoise. Sail to Genovesa Island where we climb a rock stairway in search of Nazca boobies and red footed boobies. Just beyond this is a fascinating open lava field. In the afternoon, visit Darwin Bay where we land on a sandy beach and can see more red footed boobies and the rare endemic lava gull. Return to Santa Cruz Island and see a local marine iguana colony. Walk to a lake where flamingo feed, then continue through a dry forest where land iguanas nest. In the afternoon, you can swim or snorkel in a protected bay where sea lions, turtles and eagle rays abound. Venture onto the beach which is abundant with sea lions. Note: Daily cruise schedule is subject to change. The final leg of our journey takes us to Bachas Beach. Walk to a lagoon which is home to marine iguanas, flamingoes and green turtles. Bid farewell to this natural wonderland as we fly via the port city of Guayaquil. Discover Peru, Brazil & Argentina on this 30 day tour. 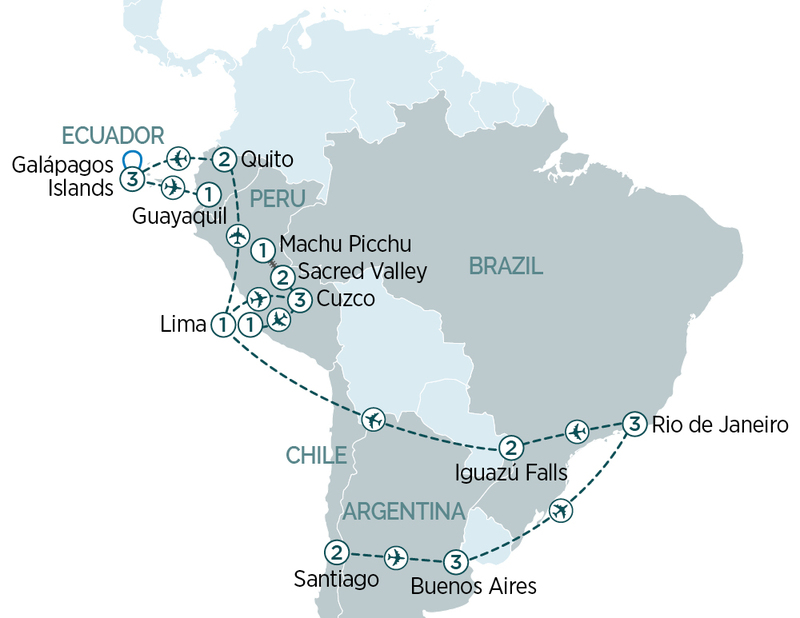 Highlights include a 4 night luxury Galapagos cruise, Iguazu Falls, Rio de Janeiro & Machu Picchu.